The Valley has a busy schedule of “mega-events” ahead, and local leaders predict it will net the area economic victories. 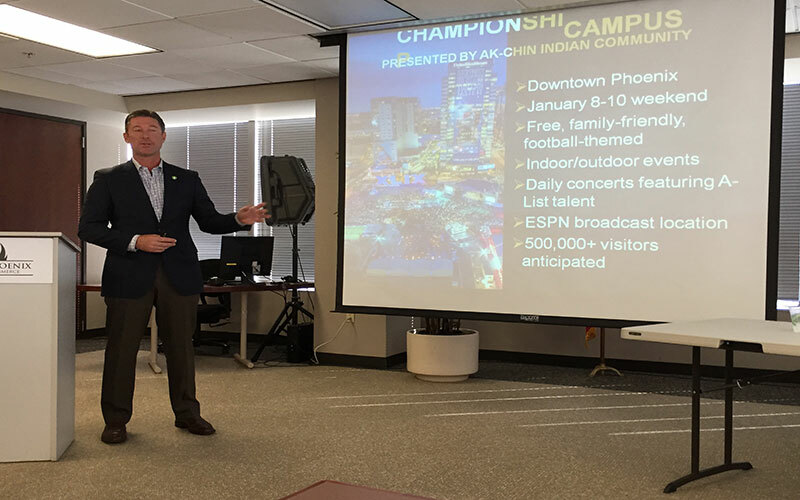 On the heels of hosting a Super Bowl that one study said brought the Valley $720 million in economic impact, Glendale also will host the 2016 College Football Playoff National Championship Game in January. Arlington, Texas, hosted the first College Football Playoff National Championship Game last year, and the San Antonio Business Journal reported that the event brought more than $300 million in economic impact. Arizona hosted four Bowl Championship Series national championship games in 1999, 2006, 2007 and 2011. Those games collectively brought in $646.2 million from hotels, meals, transportation, entertainment, rent and services and goods, according to the Arizona Organizing Committee for the 2016 College Football Playoff National Championship Game. Several events held during the playoff weekend will add to that economic impact. One of them is Championship Campus, a three-day series of activities held across five blocks in downtown Phoenix that will feature concerts and a fan experience. Phoenix will continue to bask in the national sports limelight in 2017 when it hosts the NCAA Final Four. Dawn Rogers, executive director and CEO of the 2017 Phoenix NCAA Basketball Final Four, said she expects more than 100,000 visitors for the 2017 Final Four. Rogers noted that the games will feature a music festival and fan fest similar to those at the Super Bowl. She said Arizona’s time zone also could work in its favor to spur economic impact. Angela Creedon, the chamber’s economic development committee chairwoman, said hosting mega-events isn’t just about creating short-term revenue. “A lasting impact goes back to when someone comes to the state of Arizona, a corporation that is interested in what we have to offer as a state, and they decide to either relocate or expand here,” said Creedon, who also serves as the assistant vice president of community and municipal relations for Arizona State University. It’s not just sporting events that aid the economy. Jerry Harper, deputy director of sales and marketing for the Phoenix Convention Center & Venues, said that between 2009 and 2014, the convention center had a $314 million average annual economic impact and that last year, the center held more than 500 events. Wright said Phoenix is a “world-class destination,” crediting Phoenix’s weather, infrastructure, University of Phoenix Stadium, light rail, Sky Harbor International Airport, resorts, golf courses and restaurants for that status. But he also said his host committee depends on sponsors to help shoulder the costs of hosting the college football playoff game, and the committee hopes to raise more than $14 million. Cronkite News reporter Rebecca Winn contributed to this article. CORRECTION: An earlier version of this article contained inaccurate information about the title of the game, which game Arlington hosted and Dawn Rogers’ title. The game is the College Football Playoff National Championship Game. Arlington hosted the 2015 game. Rogers is the executive director and CEO of the 2017 Phoenix NCAA Basketball Final Four. Should the Valley attract mega events like the Super Bowl and Final Four at risk of losing money?